Toronto’s Lester B. Pearson International Airport is the largest and busiest in Canada. It serves the city of Toronto, Ontario, and its metropolitan area. CYYZ is also Canada’s main international gateway offering nonstop flights to every continent. CYYZ is Air Canada’s home and main hub. Canada’s flag carrier offers service from Toronto to almost every major city in Canada and the US. It also serves every major city Latin America, Europe and Southeast Asia. CYYZ also welcomes most major airlines from countries around the world. 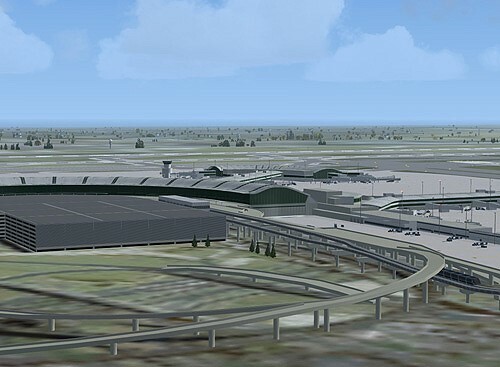 Toronto – Pearson, as it is best known, has undergone a complete transformation over the last decade. From the complete renovation of terminal 3 to the entrance in operation of the brand new Terminal 1 still under construction, CYYZ has most definitely been updated for the 21st century. The interior passenger areas have been designed to offer ample room and plenty of natural light while the exterior reflects the modern qualities and comforts of the facilities. 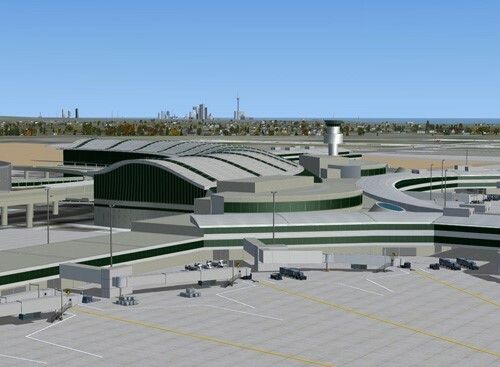 There can be no doubt that CYYZ’s new terminal 1 is amongst the most passenger friendly and esthetically pleasing facilities of its kind anywhere in the world. 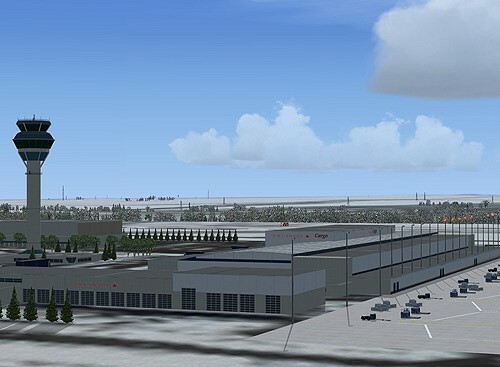 Our CYYZ, Toronto – Pearson International Airport scenery is the most current, detailed and complete rendition of this important facility for the Microsoft Flight Simulator. 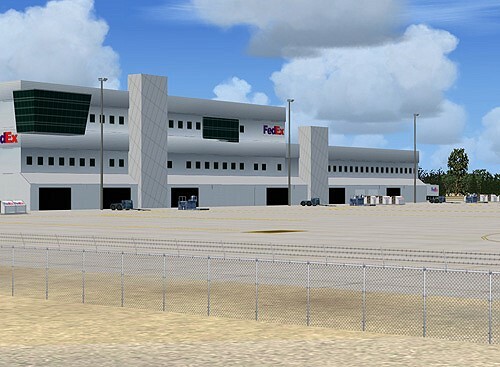 As usual, we offer it in two individually developed and formatted versions, one for FS2004 and another for FSX. The scenery includes detailed models of the two terminals in operation today. 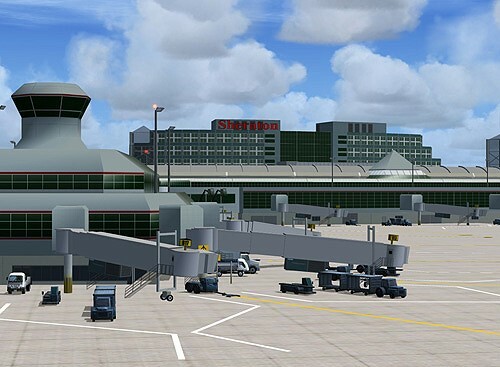 We also rendered the hotel located at terminal 3 and the people mover connecting the two terminals. The air traffic control tower and all maintenance, cargo and general aviation facilities are also included. As usual, we peeked a few months into the future and included terminal 1’s third pier currently under construction. 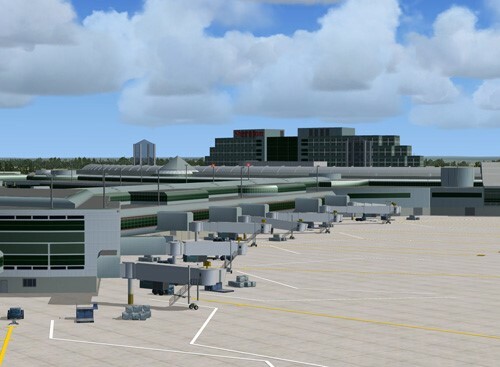 Texturing of the most visible portions of all structures was matched as closely as possible to real life in order to convey the actual look and feel of the airport. Our texturing technique enables us to optimize the image resolution while minimizing the number of texture files needed thus optimizing the sceneries performance. In our scenery, each runway is accurately located. The latitude-longitude coordinates of each runway threshold matches -within on ten thousands of one degree- the values obtained from publically available official sources. Each runway is also equipped with a full set of guidance lights and radio-aid antennas for the most realistic approaches possible under instrument flight conditions. 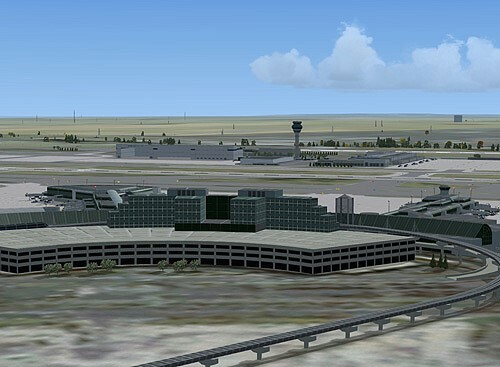 For the same reason we have included realistic ground textures depicting seasonal changes for the area in the immediate vicinity of the airport. The ground textures were fitted to match the accurately located runways and colored to match the palette of the surrounding terrain as closely as possible. The taxiway complex was then laid out to match the underlying ground textures. Taxiway signs were relocated or added to match the taxiways and facilitate taxiing in the simulator environment. 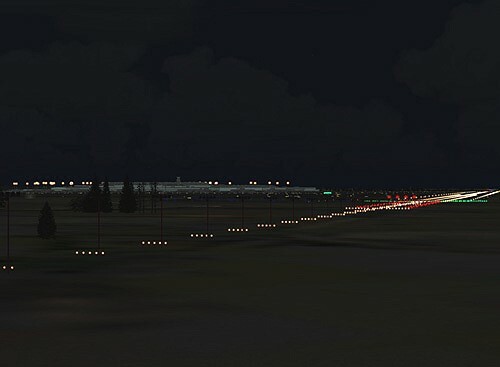 Animated hold-short lights were added at every taxiway/runway intersection. Finally, we customized the AI traffic mapping file to fit real operations at CYYZ, particularly airline gate and cargo parking spot location and orientation. Parking spots were customized to fit various aircraft models and sizes according to the most commonly used equipment for each airline and each gate. Each gate is accurately laid out and numbered. A static set of service vehicles and a parking alignment aid fixture was added to each airline gate. Please notice that, due to its evolving status, the passenger facilities located south of terminal 1 were omitted. We plan to update our scenery as this area is re-developed and a more permanent layout becomes available. * AI parking spots were fitted to accommodate specific aircraft models (including default MSFS aircraft) and we cannot guarantee that they will accommodate your favorite AI models. Customization and tweaking of the AI mapping file will most likely be necessary. Most gates were assigned to airlines operating at CYYZ in the most accurate configuration possible based on information available to the public. Parking spot specs and gate assignments are available in the enclosed documentation.